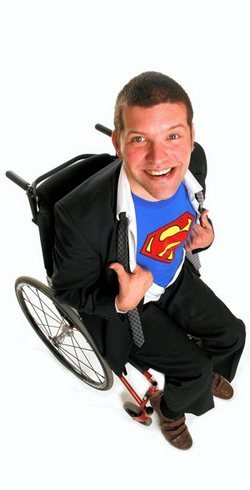 FOLLOWING sell-out shows at the Edinburgh Festival Fringe 2008, Laurence Clark, a comedian with cerebral palsy, is touring the UK with his new show Spastic Fantastic! 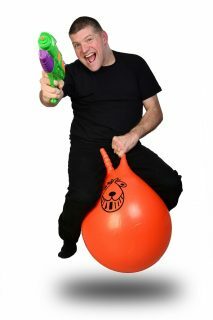 His mission is to attempt to reclaim the word ‘spastic’ through the power of stand-up comedy and hidden camera stunts. The joker – once annoyingly called a ‘sit-down comedian’ by Cherie Blair – says: “Having seen a few stand-up comics in my time, I reckon I must be one of the few who, until now, haven’t constantly used the word ‘spastic’ in their act. How would you summarise the point you’d like to make with the title of your show? The show follows my attempts to reclaim the word spastic in the same way that black people, gay men and lesbians have all reclaimed negative terms that were used about them in the past. It’s about humour, irony and seizing power by taking ownership of words that were once used destructively. You’ll have to come to the show to see whether or not I was successful. What are the funniest things about how people treat you when they see you in the wheelchair? People tend to assume that you don’t do everyday things. For example, at the airport when we were about to go on our honeymoon, my wife discovered we’d forgotten her contraceptive pills. As you can imagine, this would have put a considerable downer on our honeymoon! But the first chemist we tried refused to serve us. They said “sorry, this isn’t a special disability chemist.” Now, what the hell is a disability chemist? Do you ever use it to your advantage (ie – winding people up with scam charities!)? Negative attitudes so often get in the way that it’s refreshing when it works the other way. Sometimes I like to run over the feet of patronising gits on purpose! Then I even convince them it’s their fault for being in my way…and get them to apologise to me! Also my stunt with the fake charity collections I think beautifully illustrates the negative attitudes that I encounter every day. In the videos I’m completely upfront about the ridiculous causes that I’m asking people to donate to, however they just see me and immediately react with pity without paying any attention to what I’m saying and doing. How do you feel when you hear other comedians use the term ‘spastic’ on stage? I think that they are just after a cheap laugh. You first found fame when Cherie Blair called you a sit-down comedian. What was that like? It’s frustrating to be remembered for Cherie Blair’s crap joke as opposed to my decidedly better jokes! Your style is described as ‘in-your-face’ and you enjoy the idea of dividing a room. When you stun an audience into silence, why do you think it is (assuming your gags are technically funny!)? Touch wood this has never happened because I spend a lot of time at the start of my show breaking the ice with the audience so that they feel comfortable to laugh along with me. No comedian would ever want to stun an audience into silence! Ironic that I am asking this, but does it get tiresome talking about the ‘spastic’ issue all the time? I don’t really talk about it all the time apart from when I do this particular show. After the current tour dates I won’t be doing it again and instead will be writing a new show. I am quite looking forward to that. In conclusion, why should people come to see the show/what can they expect to see? People will see some really close to the bone comedy that exposes a side of our society that is seldom seen.